Over the last decade, as technology has quickly progressed, fortunately so has healthcare technology. In the field of dentistry, the advancement in technology has meant longer lasting, more efficient, and more comfortable treatments for patients. One of those treatments that has made the most beneficial advancements is dental fillings. Dental fillings are one of the most common procedures amongst dentists, and typically a procedure that almost every person goes through at least once. In which case, it is a great thing that they have come so far. Here at Cosmetic and Family Dentistry, we are happy to tell you that when it comes to dental fillings, we use only the most advanced technology. If it is time for you to get a filling, you may be wondering what your options are, keep reading to learn more about the advancement in dental fillings over the years. Amalgam, or mercury fillings, are your original type of dental fillings that have been used for years and years. They are known for their strong attributes which is what makes them quite useful for back molar fillings. A downside to these fillings is that because of their physical composition they can be seen in the back of the mouth when it is opened. Of all the fillings available, they are some of the least expensive. 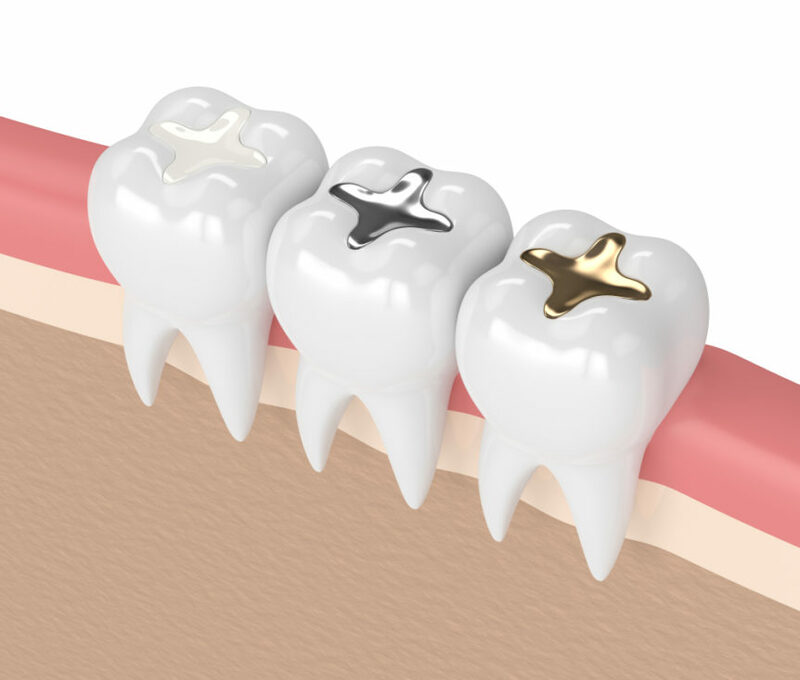 Metal fillings have been very commonly used over the years and come in gold and silver amalgam. They have also been around for quite some time just like Amalgam fillings. These types of fillings are quite durable and can last up to 15 years before needing to be replaced. Of the two, gold is much more expensive. Often people don’t like the appearance of metal fillings which is why they commonly opt for fillings that can be made to match the color of the tooth. These types of fillings are composed of glass or quartz. These were invented after amalgam and metal fillings and are advanced in several ways. A large positive of these types of fillings is that they can be created to match the color of one’s tooth so that they are not able to be seen. They are mostly used for small to medium sized teeth and less so for the larger molars in the back. Ceramic inlay fillings are of some of the latest and greatest of dental technology advancements. They are not offered by all dental offices, but we are happy to inform you that they are offered by Dr. Naik here at Cosmetic and Family Dentistry. They are often made of porcelain, or other durable materials. They are made to match the color of the tooth, and they can be used as fillings or even to correct chipped and cracked teeth as well. These types of fillings are some of the best and often preferred as they are safe, effective, and look natural. Glass lonomer fillings are also a newer type of filling, and are composed of acrylic and glass and help to prevent further cavities by releasing fluoride. The downside of this dental filling is that they are less durable than the others. Dr. Naik is a highly recommended, trusted, and caring family dentist in Irving and offers the latest and greatest of dental technology. If you are interested in exploring your options for dental fillings come see us at Cosmetic and Family Dentistry. If you have any questions or would like to schedule an appointment, contact us today.